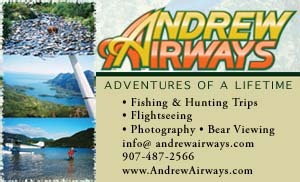 28.5 miles northeast of Fairbanks on Highway #2 to Fox, turn right on Steese Highway #6. Chatanika was a bustling community in the early 1900s. Gold was discovered not far from Chatanika Valley by Felix Pedro in 1906. Shortly thereafter the town of Chatanika was born. Chatanika Lodge is a large cedar structure, established in the late 1930s as a trading post to serve miners and trappers traveling to the gold fields or trap lines in the Circle mining district near Central, Alaska. 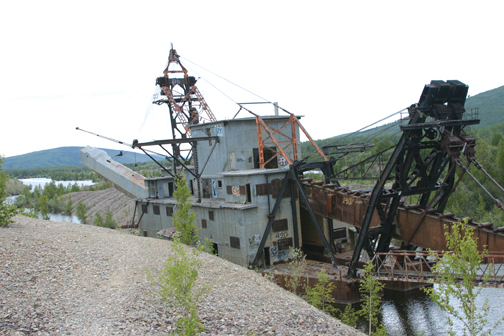 Located across from the lodge, the impressive Stacker Dredge #3 operated from the early 1920s until 1962, employing a large portion of the community. The Lodge has a large screen theater room for showing free films on the Gold Dredge and the Alaska Highway. 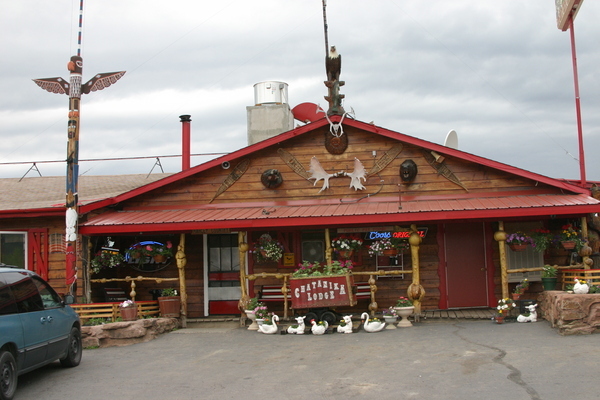 Chatanika Lodge provides overnight lodging with a rustic Alaskan atmosphere, fine dining and live music on the weekends. They also offer dry RV parking. The gift shop includes furs, hand made diamond willow hanging lamps and burls. The museum features a '55 Thunderbird, vintage snow machine and lots of antiques. Held in March, Chatanika Days features the famous "Outhouse Race," longjohn contest, pool tournament and snowmachine tug-of-war. At Mile 27.5 the historic FE Gold Camp is a 1925 settlement, built to support local dredging operations that recovered $70 million in gold by 1957. The Chatanika Valley at that time had a population larger than Fairbanks, with over 10,000 people. The old one-room Chatanika schoolhouse is still on the adjacent property and is in the process of being restored. The camp itself is on the National Register of Historic Places.